Zhang, Weiwei / Chen, Xi / Fan, Mingwen / Mulder, Jan / Frencken, Jo E.
Purpose: To test the hypotheses: 1) cumulative survival rates of fully and partially retained high-viscosity glass-ionomer (HVGIC) ART sealants with heat application and glass-carbomer sealants on occlusal and free-smooth surfaces are both higher than that of resin sealants; 2) cumulative survival rate of fully and partially retained high-viscosity glass-ionomer ART sealant with heat application on occlusal and free-smooth surfaces is higher than that of comparable ART sealants without heat application. Materials and Methods: The block-randomised clinical trial covered 405 eight-year-old children. The HVGIC was Ketac Molar Easymix, the glass carbomer was GlassCarbomer and the resin sealant was Clinpro. Retention rates of sealants on occlusal and free-smooth surfaces using conventional and modified categorisation (fully and partially retained sealants vs those completely lost [at least one-third of surface re-exposed]) were the dependent variables. The Kaplan-Meier survival method was used. Results: The cumulative survival rate of completely and partially retained resin sealants on occlusal (81.2%) and free-smooth (81%) surfaces after 4 years was statistically significantly higher, and that of glass-carbomer sealants (10.8% and 21.1%, respectively) was statistically significantly lower than those of the other sealant groups. There was no statistically significant difference in survival rates of completely and partially retained high-viscosity glass-ionomer ART sealants with (56% for both surfaces) or without heat application (56%) on occlusal and free-smooth surfaces (55.7% and 59.1%, respectively). Conclusions: Resin sealants had the highest and glass-carbomer sealants the lowest retention rate after 4 years. Application of heat to high-viscosity glass-ionomer ART sealants did not result in a significantly higher sealant retention rate. Use of the modified categorisation for determining sealant retention is advocated. Pallepati, Akhil / Yavagal, Puja / Veeresh, D. J. Purpose: To assess the effect of consuming tea with stevia on salivary pH. Materials and Methods: This randomised controlled trial employed a Latin square design. Twenty-four male students aged 20-23 years were randomly allocated to 4 different groups, 3 experimental with tea sweetened by sucrose, jaggery or stevia, and one unsweetened control. Salivary pH assessments were performed at baseline and 1 min, 20 and 60 min after consumption of the respective tea. One-way ANOVA and repeated measures ANOVA followed by Tukey's post-hoc tests were employed to analyse the data. Results: One minute after tea consumption, the salivary pH of the sucrose group significantly decreased compared to the stevia group (p = 0.01). There was a significant difference between baseline mean salivary pH and post-interventional mean salivary pH values at all time intervals in the tea + sucrose, tea + jaggery, and plain tea groups (p < 0.01). One hour after consumption of tea, the salivary pH values reached the baseline pH in stevia and plain tea groups, but it remained lower in the sucrose and jaggery groups. Conclusion: The results of the present study, in which the salivary pH values returned to baseline pH 1 h after drinking stevia-sweetened tea, suggest stevia's potential as a non-cariogenic sweetener. Purpose: The literature surrounding necrotising ulcerative gingivitis (NUG) is extensive, yet the rare nature of this disease means that there is a lack of good quality research available. This paper aims to scrutinise the literature and provide an up-to-date summary of the available information. Materials and Methods: A literature search was performed electronically using the Cochrane Library, Ovid Medline, Embase, PubMed Clinical Queries and Google Scholar. Keyword searches were carried out, utilising MeSH terms and free text. English language articles primarily were included, with key foreign language (French and German) articles included where possible from the 1900s to the present day. Results: Necrotising ulcerative gingivitis is a rare disease (prevalence <1%), with an acute, painful and destructive presentation. It is an opportunistic bacterial infection which is predominantly associated with spirochetes. Treatment of NUG must be provided on a case-by-case basis, tailored to what the individual can tolerate and the extent of the infection. Conclusion: Although there is low prevalence of NUG, its importance should not be underestimated as one of the most severe responses to the oral biofilm. Risk factors must be investigated and addressed. Treatment should consist of gentle superficial debridement, oral hygiene instruction and prescription of mouthwash and antibiotics in severe cases. Purpose: This systematic review sought to determine whether there is consistent evidence of the association between contextual social inequities and the occurrence of dental caries in adolescents. Materials and Methods: An electronic survey in ISI Web of Science, SCOPUS, MEDLINE, LILACS, Cochrane Library, and SciELO databases was performed, establishing a specific search strategy in each of them. Only analytical articles in which social indicators were measured at the contextual level published up to December 2015 were included. The risk of bias of studies selected was assessed from parameters suggested by MOOSE (Meta-analysis of Observational Studies in Epidemiology), classifying them in each item as adequate, partially adequate, inadequate and unclear. After evaluation, studies were classified as good (level 1), regular (level 2) or bad (level 3) quality. Results: Of the 181 articles identified, four met the inclusion and exclusion criteria, and of these, only one showed high risk of bias. Four articles showed significant association between contextual socioeconomic factors and caries. Despite the measurement of different social inequities such as social class and neighbourhood empowerment level, the articles showed significant association between contextual socioeconomic factors and caries. Conclusions: The scientific evidence that adolescents from areas of higher social inequity are at higher risk for caries is weak, especially considering the small number of existing studies, methodological vulnerabilities and the risk of study bias. Purpose: To present four different cases with a diagnosed cemental tear. The differences in aetiology, clinical diagnosis and treatment of cemental tears are described and discussed in order to provide guidance for clinical practice. Cases: Four patients of different ages presented with gingival swelling and other different complaints. Clinically, localised deep periodontal pockets and inflammation were noted on affected aspects in four cases. Radiographic examination revealed a prickly or flakey structure and bone loss on the affected side of the involved tooth. Different treatments, such as extraction, traditional periodontal initial therapy, periodontal flap surgery, or no clinical intervention were given based on different extents of tooth mobility and bone loss. In the first two cases, teeth with cemental tear were extracted due to poor prognosis. In case 3, deep pockets recovered to a normal condition, while cemental tears on the distal aspect of tooth 21 had no abnormal sensation or clinical symptoms. In case 4, a periapical radiograph showed distal bone loss was interrupted, and the tooth also recovered normal mobility. Histopathological evaluation of the specimens with H&E staining all resulted in a definitive diagnosis of cemental/cementodentinal tears. Conclusions: Cementodentinal or cemental tears are unique, localized, tooth-related factors associated with attachment loss. Aging, trauma and occlusal overload are the main aetiological factors. Early diagnosis and appropriate treatment will avoid unnecessary tooth extraction and result in a better prognosis. Detailed clinical and radiographic examinations as well as explorative surgery may help to make a diagnosis of cemental tears, but histopathological analysis is the only method for a definitive diagnosis. Purpose: The aim of this survey-based cross-sectional study was to analyse the oral health behaviour of dental professionals and persons without professional dental knowledge (layperson group) regarding the use and selection of tools for their personal dental hygiene. Materials and Methods: A total of 356 persons participated in the survey (dental professional group: 160; layperson group: 196). Information regarding dental hygiene habits, such as toothbrush use, toothbrushing habits, and the use of additional dental hygiene tools was determined using a standardised questionnaire. Data were analysed using the chi-squared and Wilcoxon tests, with significance set at p < 0.05. Results: 93% of the dental professional group and 89% of layperson group used manual toothbrushes (p = 0.03). Power toothbrushes were used by 57% of those surveyed in the dental professional group and 37% of those in the layperson group (p < 0.01). 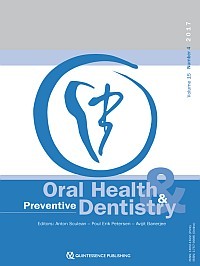 In the dental professional group, the duration of toothbrushing was significantly longer and it was performed more often compared to layperson group (p < 0.001). The use of dental floss and interdental brushes in the layperson group (dental floss 38%, interdental brush 5%) was considerably lower than in the dental professional group (dental floss 84%, interdental brush 11%; p < 0.001). Conclusion: The results of the survey on oral health behaviour revealed significant differences between the groups. The acceptance of additional tools for personal dental hygiene was low, such as dental floss and interdental brushes. Given the great importance of these tools for biofilm control, they should be emphasised in motivational measures and instructions regarding oral care performed at home. Purpose: To evaluate the prevalence of erosive tooth wear on buccal, incisal/occlusal and palatal/lingual surfaces in a wide age range of Japanese adults. Materials and Methods: The study included a total of 1108 adults aged 15 to 89 years in Tokyo, Japan. The subjects were asked to complete a self-administered nutrition-related questionnaire. Two examiners evaluated tooth wear on the buccal, occlusal/incisal and palatal/lingual surfaces in a full-mouth recording, using a modified Smith and Knight tooth-wear index. Subjects who frequently consumed acidic beverages or food, or had gastric reflux and at least one tooth with an initial enamel smooth-surface wear facet were placed in an erosion-positive group, and the rest of subjects were placed in the erosion-negative group. Results: 26.1% of the participants were placed in the erosion-positive group. For buccal surfaces, advanced wear progression was predominantly observed on maxillary and mandibular anterior teeth, especially in the youngest age group (15-39 years). On incisal/occlusal surfaces, early dentin exposure was observed in the middle age group (40-49 years) in the erosion-positive group. For palatal/lingual surfaces, wear progression was mainly observed on maxillary anterior teeth among 30- to 39-year olds and 50- to 59-year-old in the erosion-positive group, but that prevalence was lower than for the other tooth surfaces. Conclusions: For all age groups of Japanese adults, the prevalence of erosive tooth wear depended on tooth types and surfaces. Purpose: To evaluate whether increasing the frequency of its use can enhance the protective effect of AmF/NaF/SnCl2 solution against dental erosion. Materials and Methods: Sixty human enamel samples were obtained from sound human third molars, and after the formation of incipient erosive lesions (1% citric acid, pH 4.0, for 3 min), they were divided into five treatment groups (n = 12): G1 - deionised water (negative control); G2 - NaF solution (positive control) once a day; G3 - NaF solution (positive control) twice a day; G4 - AmF/NaF/SnCl2 solution once a day; G5 - AmF/NaF/SnCl2 solution twice a day. The samples were then subjected to 5 days of erosive cycling through 6 daily immersions (2 min each) in citric acid solution (0.05 M, pH 2.6). At the end of erosive cycling, surface wear was determined by means of optical profilometry. Results: One-way ANOVA showed that the surface wear was affected by surface treatments (p < 0.001). Tukey's test showed no difference between the groups in which NaF was applied once or twice, but they showed limited reduction in wear compared to the deionised water group (G1). In the groups treated with the AmF/NaF/SnCl2 solution, there was a statistically significant difference between one and two application times (p < 0.001). Although both demonstrated statistically significantly reduced tissue loss, increasing the frequency increased its anti-erosive potential. Conclusion: The AmF/NaF/SnCl2 solution proved to be effective in reducing dental enamel surface loss and its use twice a day potentiated its anti-erosive effect. Major advances in the knowledge about the aetiopathogenesis of aggressive periodontitis (AgP) have been achieved. An ever increasing number of scientific articles related to AgP are published every year contributing significantly to the knowledge of this unique and complex disease. AgP has been classified into localised and generalised forms based on their extent and disease progression with distinct clinical and radiological features. A classification of AgP based on severity (mild, moderate and severe) exists; however, it is not easily applicable. Therefore, studies on AgP do not categorise the disease based on severity. A disease staging index for AgP is proposed based on clinical and radiological features, as well as risk factors. Based on the presence or absence of risk factors confirmed by longitudinal studies, cases of AgP can be divided into low risk, medium risk and high risk profiles for disease progression. Clinicians can devise a broad treatment plan for their AgP cases based on this staging. More frequent recall intervals are proposed for patients at medium and high risk for disease progression. Ten cases of AgP with 10-year follow-up were used to validate the staging index by retrospectively assigning prognosis and associating it with tooth loss. The use of this staging by researchers would increase external validity of research on AgP. Long-term analysis of AgP cases are needed to validate this staging index longitudinally. Purpose: To determine whether chemical and thermal stress as well as sharpening are aspects that must be considered to determine when a curette has become too weak to be used safely without the threat of breakage. Materials and Methods: A total sample of 35 curette blades was divided into 2 principal groups, control (groups 1 to 3) and experimental (groups 4 to 6). The control group was divided into 3 colour-coded groups of 19 similar curette blades and was only subjected to progressive sharpening wear (not sterilised). The test group included 16 Gracey curette blades that were subjected to various degrees of progressive wear and different numbers of sterilisation cycles in 3 subgroups (subgroup 4 had 5 sterilisation cycles; subgroup 5 had 30 cycles and experimental subgroup 6 had 55 cycles). Using a universal testing machine, all blades were tested for strength until they fractured. Results: No evidence was found that the simple presence or absence of sterilisation cycles produced a statistically significant difference between the two studied groups (sterilised and not sterilised). However, when comparing the six subgroups that underwent different numbers of sterilisation cycles, the analysis showed that the more sterilisation cycles a curette underwent, the more likely the curette was to fracture (p = 0.047). Conclusion: Sterilisation by itself does not produce a significant change in the fracture strength, whereas the number of sterilisation cycles clearly weakens the instrument. Sterilisation is a factor to control when evaluating the life of a periodontal curette for the patients' and professionals' safety. Purpose: This cross-sectional study aims to evaluate saliva, serum levels of interleukin-21 (IL-21), IL-33, and prostaglandin E2 (PGE2) in patients with generalised chronic periodontitis or aggressive periodontitis. Materials and Methods: Before initiation of any periodontal treatment, saliva and serum samples were collected and clinical periodontal measurements were recorded from 94 participants (25 aggressive periodontitis patients, 25 chronic periodontitis patients, 44 periodontally healthy individuals). IL-21, IL-33 and PGE2 levels in serum and saliva samples were determined by ELISA. Data were tested statistically using Kruskal-Wallis, Mann-Whitney U-, and Spearman-rho rank tests. Results: Saliva IL-33 levels were statistically significantly higher in the chronic than the aggressive group (p < 0.05). Serum IL-33, saliva and serum IL-21 and PGE2 levels were similar in the two periodontitis groups. Saliva IL-33 levels correlated with age in the chronic periodontitis group (p < 0.05). Statistically significant positive correlations were found between serum, saliva PGE2 levels and plaque index (p < 0.05). IL-33 and IL-21 levels in serum samples positively correlated in the periodontitis groups (p < 0.05). Conclusion: IL-21 and PGE2 analysis did not exhibit discriminating data between generalised chronic and aggressive periodontitis, but the present findings support the role of these cytokines in periodontitis. Statistically significantly higher saliva IL-33 levels in the chronic periodontitis group warrant further research. Bassetti, Mario A. / Bassetti, Renzo G. / Sculean, Anton / Salvi, Giovanni E. / Bornstein, Michael M. / Ramseier, Christoph A. Purpose: To evaluate the awareness of cigarette smoking as a risk factor for chronic periodontitis in patients either undergoing active periodontal treatment (APT) or enrolled in supportive periodontal therapy (SPT). Materials and Methods: Comprehensive tobacco use history was collected with a questionnaire in 50 patients before and after APT (test) and in 50 patients (control) enrolled in SPT at the School of Dental Medicine, University of Bern. Carbon monoxide (CO) exhalation levels were measured in both APT and SPT patients. Results: In the test group, 94% (n = 47) completed the study. Before APT, 48% of these (n = 24) knew about the association between smoking and periodontal disease, while 42% (n = 21) assumed a possible association and 10% (n = 5) did not. Following APT, 53% (n = 25) knew about the association, while 34% (n = 17) still assumed a possible association and 10% (n = 5) did not. In the control group, 60% (n = 30) of SPT patients knew about the association of smoking with periodontal disease, while 30% (n = 15) assumed an association and 10% (n = 5) were not aware of any association. In both APT and SPT patients, neither between-group nor baseline to follow-up differences were detected (p > 0.05). Conclusions: Brief interventions for tobacco cessation during APT or SPT failed to increase periodontal patients' awareness of smoking as a risk factor for chronic periodontitis. In order to both increase awareness and motivation to quit tobacco use, more counseling than conventional brief interventions may be needed.